Force Crag mine took centre stage again last week, firstly with a school visit and then a day working with my volunteer team. 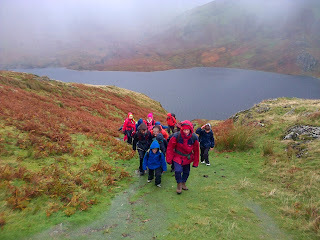 The school group was from Braithwaite School in the village situated at the foot of Coledale Valley. There may have been mineral workings on Force Crag since the 16th century but significant mining began in the 1800s to extract lead and silver. When the price of lead fell to uneconomic levels, attention turned to extracting barytes. In the mine's final years lead, barium and zinc ores were extracted. Eventually a collapse in the mine led to its being closed in 1990 and it was handed over to the National Trust. The buildings and machinery remain the only complete examples of their type in the Lake District and the mine is now a Scheduled Ancient Monument that is situated in a Site of Special Scientific Interest (SSSI). For this school visit, John Malley (the Trust’s Water Adviser) joined us. He is the Trust’s lead officer involved in the project to develop the best strategy for dealing with the water collecting in the old mine workings. So the children were able to learn a lot of science, especially chemistry, from him. They also had the opportunity to go inside the building and see the machinery that was used to crush the ores and to make ‘rubbings’ of machinery labels etc. as part of a pictorial record of the site. It was an excellent day with one of their highlights being the wearing of hard hats to go behind locked doors where they could see the workings and experience something that the miners experienced! Later in the week, I returned to the site with my volunteers to do some work diverting water around the scree slopes above the mine. This is one of those jobs where the best option is just to set to work with shovels and wheel-barrows and some hard work hand-digging to channel the water away from the screes. This should stabilise the slope. My great volunteers were, as ever, undaunted. Daisy here:Me and Roy went digging in the rain. It was horrible, horrible. Then we went back with the volunteers when it wasn’t raining. That was quite good. 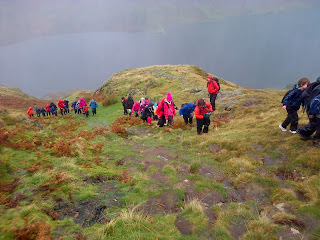 We’ve just had the Friends of the Lake District Fell Care Day and I was working with a group of pupils aged between 8 and 11 from the feeder schools for Keswick School. We were working in Cockshott Wood doing some coppicing. Coppicing is a centuries-old way of managing woodland. If trees are cut down to ground level they will send up new shoots from the stump or roots. After a number of years, the new growth can be harvested and the cycle begins again. Cutting back the trees in this way allows light into the forest floor. This encourages greater diversity of both animal and plant species. Bluebells, anemones and primroses can grow more vigorously. Rotting wood-piles provide habitats for beetles, insects and small mammals. This in turn brings in more birds and butterflies. When the trees mature, the canopy eventually closes off the light to the woodland floor and the wood needs to be coppiced again. Ideally there will be a newly-coppiced area close by for the species to migrate to when they need to. So we started the cycle of creating a mosaic of different ages of coppicing. 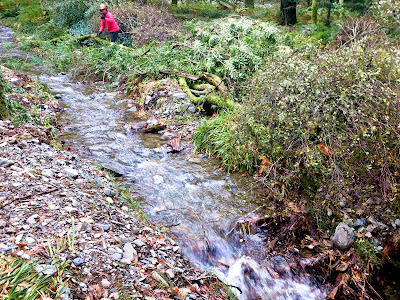 We will also be building eco-heaps of cuttings to add variety to the habitats. An extra bonus to this is that we can identify individual trees that we can leave with adequate space and light to grow to full maturity in future. There should be some excellent specimens of oak trees for following generations. 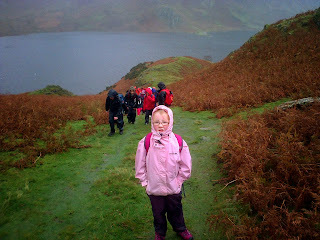 These pupils will be able to bring along their own children and grandchildren to show off the results of what they are doing now.I also had a group of students from the Lakes College who did some great work resurfacing a length of path that was cleared recently by my regular volunteers. So we are making good progress on creating access for all around the wood. It was an excellent day all round and it’s a big ‘Thank you’ to everyone who took part. The children enjoyed it so much that they didn’t want to stop at the end of the day! That’s something we hope they will carry with them throughout their lives. Daisy here:I’ve been running round the woods with lots of people - lots of children and they spent all day cutting sticks for me. It was great. ﻿And this is how I start my normal daily commute into work as a countryside Ranger on my trusty iron horse, a journey I’ve made a thousand times before, but this morning it feels somehow different, otherworldly, I have a sick feeling in my stomach and feel so damn cold. A mile along the lakeshore cutting my way through the mist , the sound of the Windermere car ferry, creaking and groaning as it pulls itself along on metal chains. I am reminded of the ferry disaster of 1597. A wedding party 45 strong returning from Far Sawrey cram themselves onto the ferry which was in those days just a large rowing boat . The outward journey in calm waters, full of laughter and merriment turned to disaster on their return as the winds picked up the wedding party high on drink but low on balance, capsized the boat and 38 people drowned . 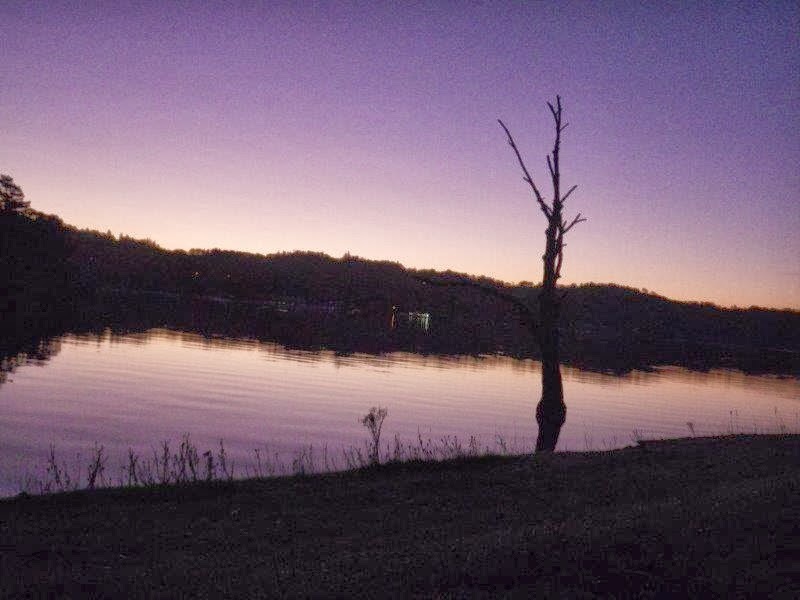 The biggest loss of life that this lake has seen. Since then people have reported seeing faces in these murky waters and swimmers have felt hands grabbing their ankles trying to drag them under to join the wedding party. These are probably just reflections and submerged weeds, but his morning through the mist the buoys that surround the islands look eerily like floating lifeless bodies . 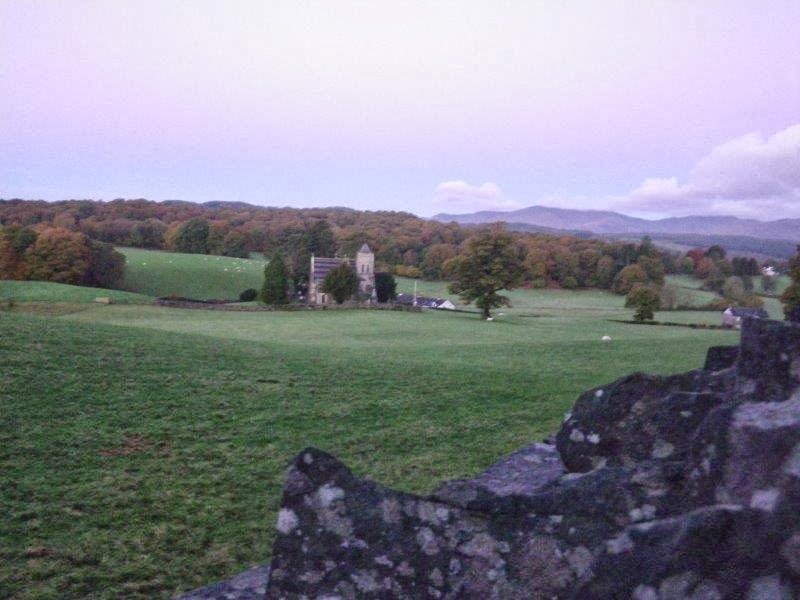 Onward and up ferry hill to the church at Far Sawrey, the late flowering devils bit scabious scattered on the grassy road verges. Chattering crows gather on the wall watching me pass by like they’re waiting for something to happen. Through the Sawreys and along the side of Esthwaite Water this is always the coldest part of the ride in, this morning it is icy cold I look out across the water towards the Devils Gallop. In medieval times when Hawkshead was the main market town in south Lakeland the packhorse men would spur the horses on double-quick along this lonely stretch of road trying to keep one step ahead of old nick. Through the mists I hear the sound of hooves and a sudden snort of some large hidden beast on the other side of the hedge gets the adrenaline racing and I put my foot down on the pedals just that bit faster. Approaching Priests Pot, a small circular tarn on the edge of Hawkshead village past the site of the gibbet . This was an upright wooden post with a projecting arm for hanging the bodies of executed criminals. A bit like a giant bird feeder, it acted as a blunt warning to the packhorse men approaching the village, with its 14 public houses, to behave themselves when they got paid or as a reminder as they were leaving that they may have got away with it this time but next time they might not be as lucky. Riding through the village the speed camera on the corner shouts 13 at me in bright red numbers (why is it always 13) is it trying to tell me something? 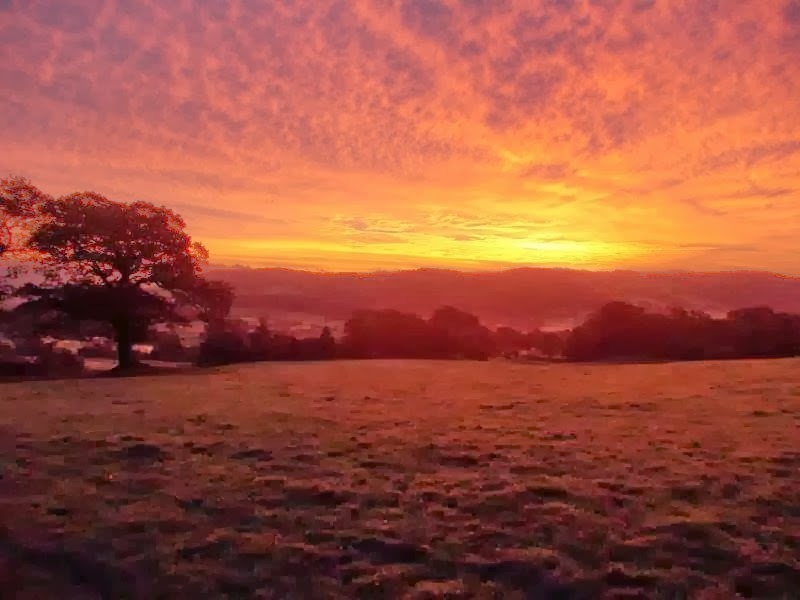 ﻿﻿Climbing up Hawkshead Hill ,out of the mist now the ghost of the mad monk seems to be fading, but the late rising sun offers no heat and has cast a deep bloody hue over everything, the silent ghostly figure of a barn owl sweeps low across the field to my left. It is folklore that these owls carry the souls of the recently departed I look back to see Claife under a blood red sky, and it looks most peculiar. Up ahead I can see a black figure crouched over something in the middle of the road is that a shadow or... As I get closer the figure stands up and breaks apart, exploding in ten different directions at the same time, the sound of a cape? No it’s the sound of wings flapping as a murder of carrion crows disperse into the trees above, not wanting to move too far from what was interesting them lying on the tarmac. What was interesting them is a mass of blood and bone and entrails, road kill of some description. Feeling bad enough I can’t bear to look too closely so I cycle on and the pain in my back and the cold are just getting worse. I finally reach the crossroads at High Cross and now have an easy descent, freewheeling down to our Ranger base in Coniston. The base is very quiet, unusually quiet for a workday, I walk into the kitchen area and on the table lying open on pages 7 and 8 is the most recent edition of the Westmorland Gazette and my eye is drawn to a short article ‘National Trust Ranger killed in early morning traffic accident ‘gripped by a crushing fear and understanding, the cold and the pain intensify, the room starts shaking and then suddenly the pain and the cold disappear along with the colour, the light, the sound… When you are walking the paths and lanes of South Lakeland if you feel a sudden unexplained rush of wind passing by or the squealing of brakes when no bike is around to be seen , it might just be me on my way into work again...ghostrider. The Upland Footpath team have recently come down from their main work in the fells and are starting their winter work programme. It is not practical to work in the fells all year round due to the shorter days and the weather can make upland work unsafe and unproductive. 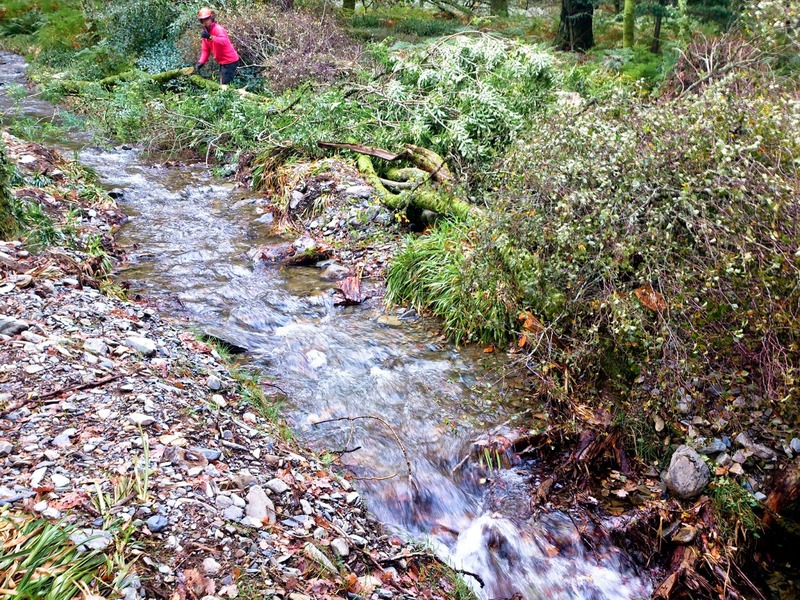 There is also no shortage of work that the team can help with in the lower level countryside of the South Lakes. Now seems like a good time to re-cap on our main upland project this year, which we recently completed. 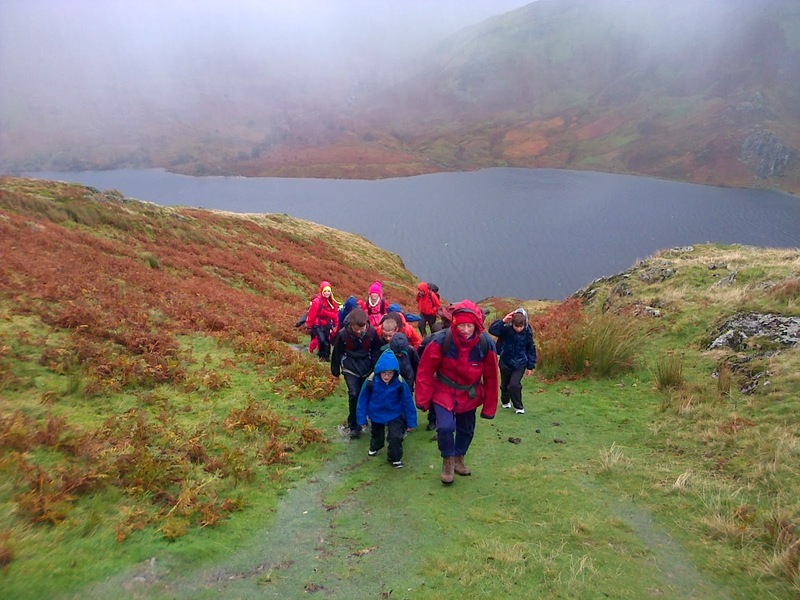 This project was on a path from Grisedale Tarn up Fairfield and has featured in previous blogs, such as 'Itching to do some Pitching...' published in June. The main section of work was on a nasty erosion scar that had been developing and the solution involved constructing around 100 metres of stone 'pitched' path. 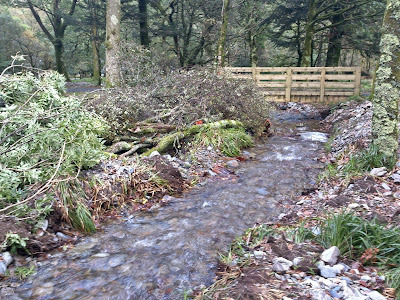 There was also loads of landscaping work to do to help blend the path into the surrounding uplands and to encourage people to keep to this path. The sequence of photographs below, each taken from a similar location, shows the development of this section of path. 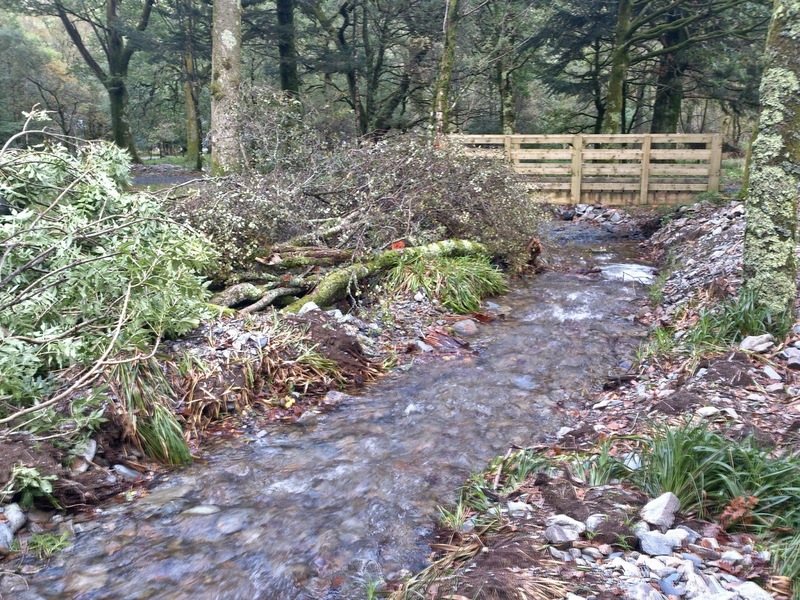 The team have enjoyed this project and are pleased with the path. The stepped stone pitching has created a sustainable path surface and is an improvement on the erosion scar which was only going to deteriorate. Once again I had The National Trust Regional volunteers joining me at the weekend. This is a group I work with twice a year and it was good to see them back again. We worked in Cockshot Wood, the little wood behind the Trust shop at the lake shore. We did some preparatory work on making accessible a section of the loop of footpath that goes around the wood. This is an ongoing project aimed at making the whole of the path in the wood as accessible as possible for everyone. Once it is completed, we will have opened up another stretch of path and woodland for wheelchair users, pram pushers and others with mobility difficulties to enjoy. 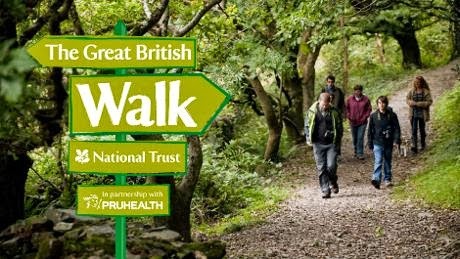 This project is part of the National Trust’s campaign to get people “outdoors and closer to nature”. Next week is a Fell Care Week when lots of volunteers from Friends of the Lake District and the National Park will be joining me and other National Trust staff to carry on the project. During the week we had the Trust’s National Archaeological Panel visiting Force Crag Mine. This is another ongoing project that I’ve mentioned before. It has three parts to it. First is to deal with the water that is discharging from the old mine. So we now have some large diggers at work in the middle of a Scheduled Ancient Monument digging it up for the installation of settlement tanks. It might look a bit shocking at first but all necessary consents have been granted after extensive relevant consultations including with archaeologists. If you want to make an omelette, you have to break eggs! In the long-term this will be beneficial for the site. Our second concern is the interpretation and presentation of the site. This was the last working mine of its type in the Lake District and is the only one surviving with all its machinery in situ. We want to be able to tell its story using ways that complement the site. Thirdly, we need to develop a plan for its future preservation. So those were the three topics for discussion with the panel. It will be interesting to read their conclusions. As a backdrop to all these activities, we are moving quickly into Autumn. The bracken and trees are changing colour day by day, the days are shortening, it is cooler and there are fewer people around. 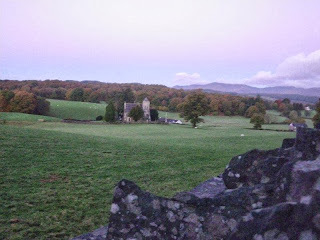 I love the valley all year round of course but autumn colour on a cold, sunny day is spectacular. I’ve been mountain biking – well, running alongside Roy. No photographs – I’m too fast. Fungi season is upon us! 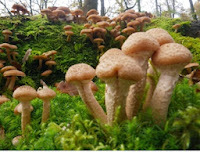 The Kingdom Fungi includes some of the most important organisms in terms of their ecological and economic role. They break down dead organic material, continuing the cycle of nutrients through ecosystems. 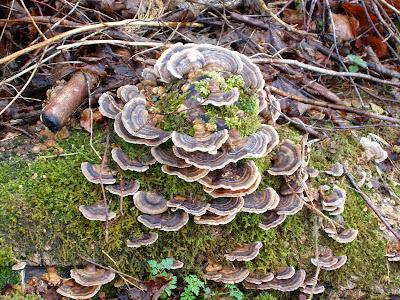 Members of the fungi kingdom include yeasts and moulds as well as the familiar mushrooms. Tree surveys are generally carried out at this time of year, as fungi are great indicators as to the health of the tree. 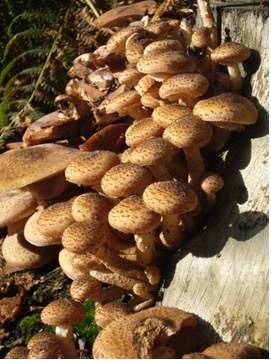 Honey fungus is the common name given to several different species of fungi (Armillaria). There are six Armillaria species found in the UK that live on dead and decaying woody material; only two of these are also able to attack living plants, killing the roots of woody and perennial plants. Shaggy Scalycap (Pholiota squarrosa) appears at the bases of old trees and sometimes on the stumps of felled trees - mainly broadleaf species but also occasionally conifers, notably spruces. The Shaggy Scalycap is often confused with Honey Fungus. 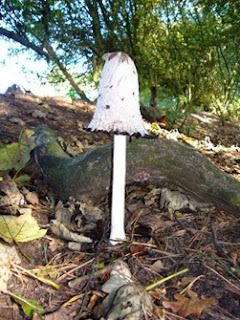 The Shaggy Inkcap or the Lawyer's Wig (Coprinus comatus) occurs in meadows, woods and roadside verges. The young fruit bodies first appear as white cylinders emerging from the ground, and then the bell-shaped caps open out. 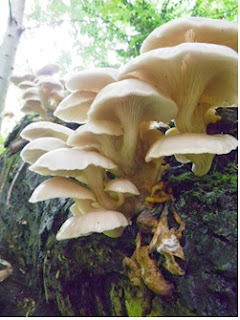 Edible Oyster Mushrooms are a great non-meat source of protein, rivalling beans and any other vegetable source. 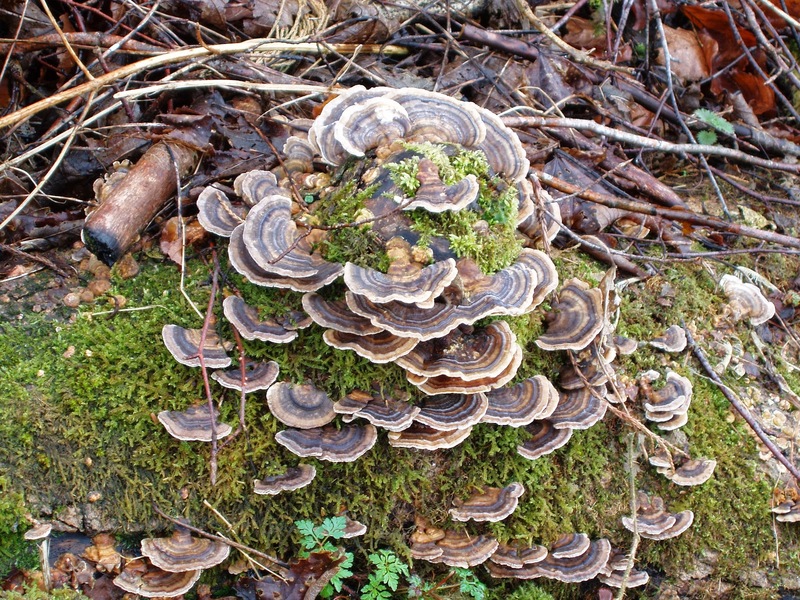 They vary in size, shape and colour, growing in shelf-like clusters on dead logs and living trees (primarily hardwoods, but sometimes on conifers). 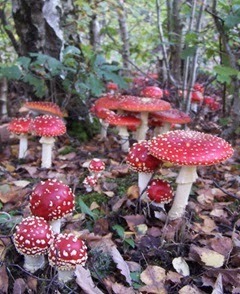 The common name Fly Agaric (Amanita muscaria) is a reference to the tradition of using this mushroom as an insecticide. In some European countries caps of Amanita muscaria are crumbled up and placed in saucers of milk to attract house flies. 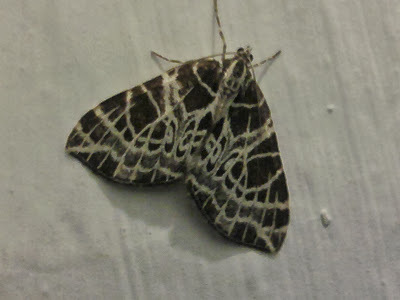 The flies drink the milk, which contains toxins - they are soluble in water and hence in milk also - dissolved from within the mushroom, and the flies soon become drowsy, collapse and die (or they simply drown in their spiked milk drink). Following on from the macrophyte survey last week, I’ve been across to Derwent Island again with contractors. Standing on the island looking along the lake and down Borrowdale valley as we discussed what is to be done reminded me just how lucky I am to be working here. I work in a superb landscape. The job offers very diverse challenges. Every day is different. I know I might be a little bit biased but, from the high fells like the top of Great End right the way through to Keswick, my area is a fantastic place to live and work. On the rare occasions that it rains in the Lake District, just go and look at the waterfalls! It’s still beautiful. I'm in the Keswick Reminder. I hope no puppies are using the Keswick Reminder for what I used to use it for. Daisy (and me) on TV. I can start the blog this time with some exciting news. In the list of good links, there are some new ones. They take you to information about a new ITV series of 20 programmes that follow the work of the Trust. The series begins on Sunday October 6that 12.25pm and Daisy will feature on a number of occasions – there might even be a space somewhere for me! Meanwhile, change is afoot for Derwent Island House which will soon have new tenants. The current tenants are leaving so we are looking for new ones. We are taking this opportunity to make some changes. As part of that process I recently spent a very pleasant morning with John Hooson (The Trust’s Wildlife & Countryside Adviser) doing a macrophyte survey of the vegetation on the lake bed around the pipe-line that conveys the amenities to the island. Macrophytes are aquatic plants that provide cover and food for fish and also oxygenate the water so it is important that they are not threatened. We are planning to upgrade the service pipeline so next week I’ll be back out there with our Buildings Adviser and various contractors. I have also been busy with the Mountain Rescue team. We have recently been having training sessions using the newly-installed anchor points on Sharp Edge. This is an initiative that has been two years in coming to fruition. 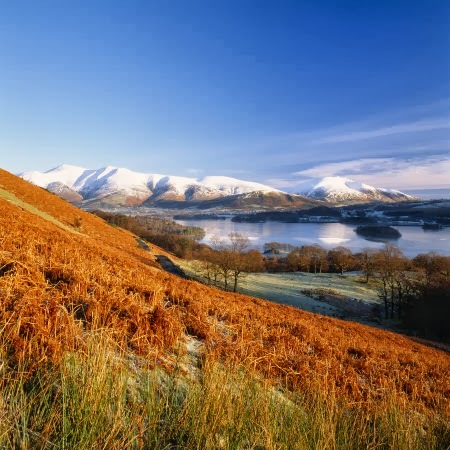 There has been extensive consultation with the landowners, with user groups including the British Mountaineering Council, the Mountain Liaison Group, various climbing groups and also Natural England. 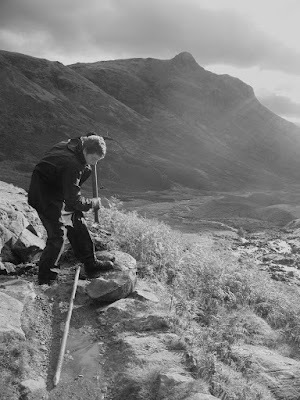 These anchor points are not intended for general use by walkers and climbers but are for use in mountain rescues. They have been sited very carefully so that they do not detract from the experience of mountain users but they will make mountain rescues from the ridge or the gulley safer endeavours. Over my years of being involved in rescues, I have seen that some of the cracks in the rock that we have used for safety anchorage have been widening and there was a real concern that soon there would be a failure that would result in an accident for the rescue team. On a recent joint rescue with the Langdale team, after the missing person had been found safe and well, a colleague and I continued on up the fell. We had been searching in thick cloud with about 10 metres of visibility but at 11 pm we emerged at the summit of Great End and found ourselves above a temperature inversion. The valleys were shrouded in thick mist with just a few of the higher peaks rising above it. We were treated to clear skies with a big moon plus countless stars and satellites. So a successful search was topped off with a memorable experience. I’ve got another new friend. It’s Mollie. She’s one of the Recruiters’ dogs and she’s really new. I’ve been teaching her how to play with sticks.